The inexplicable magic that ties us together and warms our hearts – the music. Many have tried to define it, figure out what is it about it that makes our emotions surface and reach new heights, but music cannot be put into words. It is a language that everybody speaks and understands, as music is felt in the heart. They say that it is impossible to travel through time, but music can take us anywhere we want. Music has the ability to awaken the past, intensify the present, and show optimistic glimpses of the future. Music is known as the ultimate remedy, the best therapy, and even as a confidence booster. All you need to do to bring some sunshine into a grey rainy day is play your favorite tunes and let the music guide you through the hard times. Music is our trusty companion when we cry, when we laugh, celebrate, or go through a sad phase. It has the power to absorb the negativity and release happiness because music is the shelter we can always run to. Music listens selflessly and erases the sorrow, while also being an inevitable part of our greatest times and accomplishments. Music is an irreplaceable element of every segment of life. Every show has its theme song, and we could say that every single one of us carries that one special tune, that music that aligns with our lives perfectly. Often couples choose a song which symbolizes their unique love story, and that is the music they play whenever they’re reminiscing about the past, or celebrating an important milestone. Music marks days, years and lifetimes, and sometimes all it takes to relive a priceless moment is to play a fragment of a song and embark on an emotional journey down memory lane. The Paper Music ketubah converts the most beautiful tunes into a gold and white rhapsody on canvas. 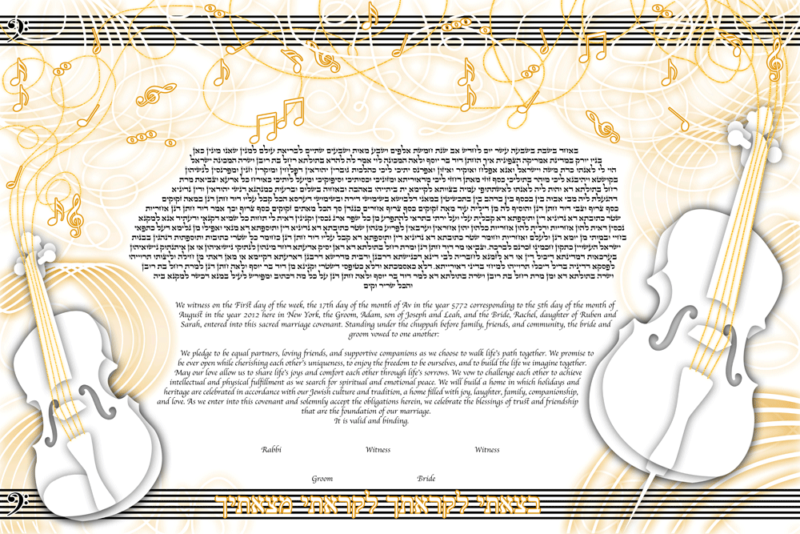 This music inspired ketubah design embodies the sensuality and romance experienced through a couple’s favorite song, and it can symbolize the tunes that brought them together during their first dance. There is hardly a better way to truly experience music than in a concert, which is exactly the atmosphere our Concert Lights design captures. In concert, you’re able to enjoy music in a unique ambient which includes the lighting, the colors, and the people who share the same emotion and passion.